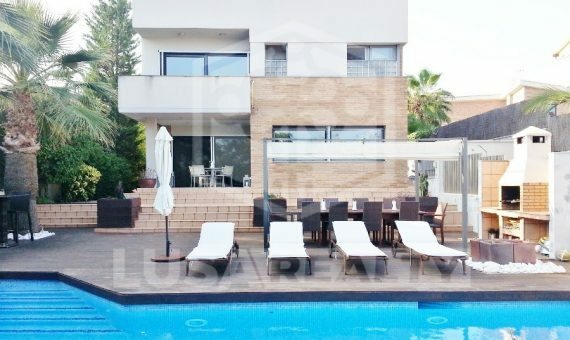 Independent family house in the urbanization of Aragai of Vilanova I La Geltrú, also known as “tennis”, with more than 650 m2 plot and 300 m2 house. The house has 3 large double bedrooms and one suite with bathroom, jacuzzi, changing table, solarium and separate terrace. Distributed over 2 floors and garage, the house has 3 bathrooms, pantry, a large kitchen and a large dining room with fireplace. Facing south, it enjoys sun all day and during all seasons. The pool is ideal for swimming because of its length or relax by built at one end jacuzzi. In the garage can fit up to 3 cars. Located in a quiet and safe area, the house is ideal for families with children, both for summer and for year round living.